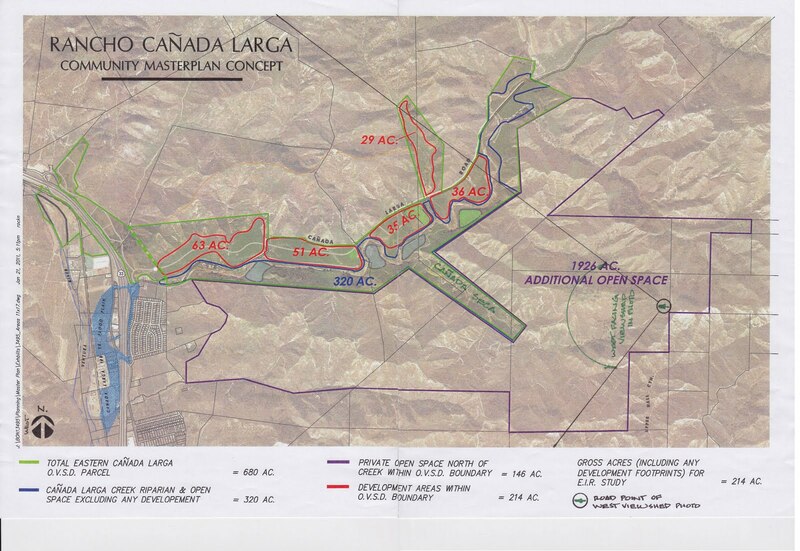 The meeting featured more than two hours of public testimony, with virtually all speakers urging the council to avoid altering the picturesque canyon four miles north of town. Of 40 speakers, only one — the valley’s owner who would benefit financially from development — spoke in favor of its inclusion into the city. 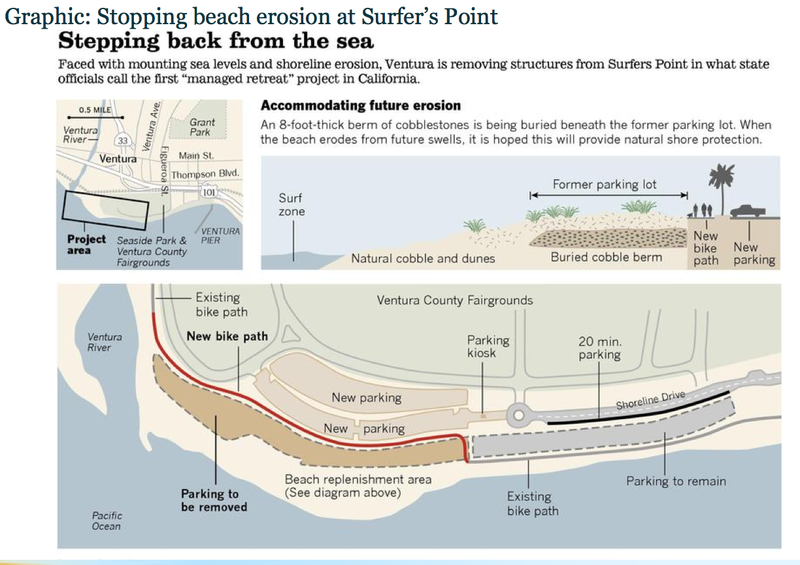 By a 5-1 vote, the council agreed to spend an additional $45,000 to complete a fiscal and market analysis on portions of north Ventura Avenue and the Cañada Larga area, the results of which Councilwoman Christy Weir said were necessary for her to make a decision on how to proceed. Councilman Jim Monahan was forced to recuse himself because he owns property in the area. Weir, along with Council members Neal Andrews, Monahan and Mike Tracy, contend annexation of the rural valley to allow no more than 100 executive homes could generate needed property tax funds and help lure the types of big businesses that provide high-wage jobs. “You have to have some high end homes,” Weir said. Sunday, January 16, 2011: The Los Angeles Times published a front page story on the Surfers' Point Managed Shoreline Retreat project. 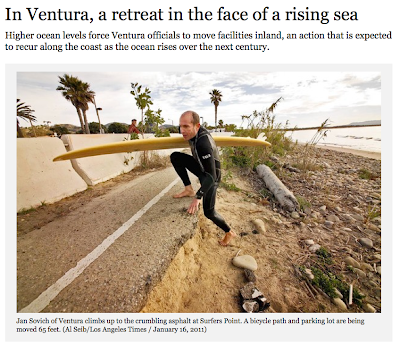 'The effort by the city of Ventura is the most vivid example to date of what may lie ahead in California as coastal communities come to grips with rising sea levels and worsening coastal erosion. 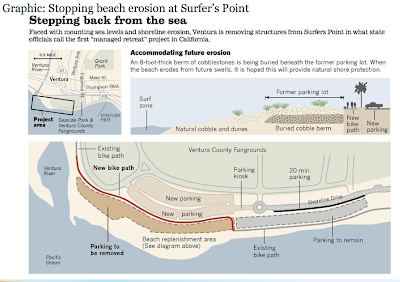 ...As the coastline creeps inland, scouring sand from beaches or eating away at coastal bluffs, landowners will increasingly be forced to decide whether to spend vast sums of money fortifying the shore or give up and step back.